This free Bible lesson is based on John 20:1-18 when Mary Magdalene visits the tomb and Jesus rose from the dead. It is designed for children’s church or Sunday School. Please modify as best fits your ministry. If your church follows the Revised Common Lectionary, this teaching plan would correspond to Year B – Easter Sunday, Gospel Reading – John 20:1-18. Hide empty eggs around the room. After the kids find the eggs, let the tell you one thing they love about Easter for each egg they found. Easter is one of my favorite days of the year. And it’s not because of Easter egg hunts, or candy, or crafts. It’s because of miracles! Do you know what a miracle is? A miracle is when something completely impossible happens. When there is absolutely no way for it to be true, yet it is. And at Easter, there are a lot of miracles for us to celebrate. I bet you can guess the biggest one. Jesus rose from the dead! After 3 whole days of being dead, Jesus was alive again! I can’t imagine a bigger miracle than that. Miracle number 1. But it makes me so happy to think that Jesus didn’t have to suffer for us forever. When He took our place on the cross, He was whipped, beaten, and had huge nails forced through His hands and feet. And then, carrying all of our sins, He suffered horribly in hell for 3 days. So much suffering for an innocent man. But Jesus chose to suffer so that we wouldn’t have to. So that we might be able to join Him in heaven. I think that amount of love is a miracle. For someone to love you SO much more than they love themselves, and to willingly suffer through so much pain; it’s another miracle. Miracle number 2. After Jesus rose from the dead there was another miracle. Jesus was buried in a small cave dug out of a rock, and to close it up they would roll a HUGE rock in the opening. It would take tons of men pushing together to get that rock to move. But when Jesus rose from the dead, that rock moved. With no one touching it, that HUGE rock moved out of the way. Miracle number 3. Do you think that’s everything? Of course not! Later that very day Mary Magdalene went to visit the tomb. When they saw the rock had been moved and Jesus was gone, she got very upset. She thought someone had stolen Jesus! But the next time she looked, it wasn’t empty at all. 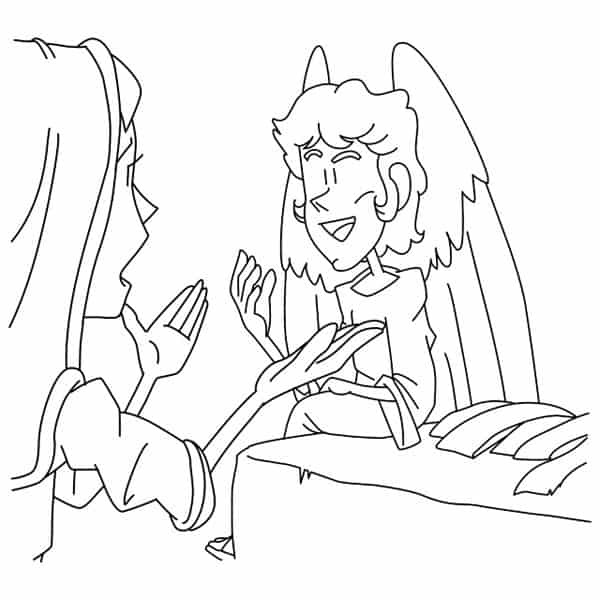 There were two angels sitting right where Jesus had been. Angels! Can you imagine? I call that miracle number 4. At first Mary didn’t understand. She thought those angels had stolen Jesus, and she started to cry. Mary turned around and was shocked to see someone right behind her. She asked didn’t know who it was, and asked if they were the one who stole Jesus. But as soon as Jesus said her name, Mary could tell it has Jesus. All with one word, this man went from total stranger, to close friend. Miracle number 5. Then Jesus sent Mary back to the disciples so she could tell them what she had seen. In such a short time, Mary was able to experience 5 miracles. 5! Jesus suffered out of love. The rock was moved and the tomb was opened. Angels appeared and spoke to Mary. Jesus appeared, looking first like a stranger, then as beloved friend. Those are the things that make Easter so special. Miracles are so much better than candy. Jesus is so much better than the Easter Bunny. Angels are so much better than hunting eggs. And Jesus is so much better than it all. Activity B – Easter Miracles – The Tomb is Empty! Give each child some small pieces of paper and coloring/writing utensils. 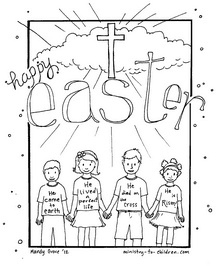 Then have them write or draw something related to Easter, God, Jesus, etc. on it. Then stuff each egg with one slip of paper and have the kids hand out the eggs after class to parents, other kids, visitors, etc. Before leaving, ask for a volunteer to pray for the class, and encourage them to tell God how thankful they are that He suffered in our place, and how happy they are that Jesus rose again. Your lessons are always so helpful for my Sunday School classes! Thank you! Tony Kummer (Editor) reviewed & updated this page on : April 6, 2019 at 7:21 pm. All our content is peer reviewed by our readers, simply leave a comment on any post suggest an update.